Who doesn't love this concealer? Since discovering it I have not gone without at least one tube of it in my makeup collection! I just find that it works really well to cover any redness and for any discolouration under the eyes. It's also really light and doesn't go all cakey which I really like. Again I need to get to Boots asap to get another! You have no idea how excited I was when I found out that a Pharmacy in town was stocking this, however when I seen it in person and seen the price tag underneath I almost had a heart attack, this little bottle cost me the same price as it would for the big bottle of the Garnier Micellar water. However that aside I picked up the small bottle to try out as I didn't fancy splurging €16 (yeah you read that right!) on the large bottle incase I didn't like it. Sadly for my bank account I absolutely adored this product!! I'm not even joking I now get the hype it definitely feels a lot more moisturising when on the skin and it definitely dissolves your makeup a lot quicker. I used this little bottle up a lot quicker than I had planned to but like I said sadly for my bank account I can see myself purchasing the big bottle of this. As I'm sure I said before this is my holy grail mascara however now that it's run out I'm going to move through my other mascaras before repurchasing it. I will more than likely ask for this as a birthday present in August as even though I love it I'm not in a rush for it. Now that this is empty I can finally work through the mascaras piled in my makeup drawers however if anyone knows of a Drugstore Waterproof mascara please let me know because it's hayfever season and so waterproof eye products are currently necessary. I have been using this so much this past month and a bit, especially in work like literally every hour! As it's a body spray it's quite light and wears off quite quickly but because it's nice and fresh and a light scent I really like it. I also like that it's nice and light because there is nothing worse than when someone is washing your hair and they have a real strong perfume on and you're basically choking so how kind am I thinking of clients when washing their hair *sassy girl emoji* However now that it's almost gone I cannot wait to get my hands on Zoe's new range. I finally hit pan on the brown shade and oh my god it was the best feeling because I swear I feel like I've been using this for ten thousand years (I haven't) however I'm not going to stop using this as I do still adore it and think it's great quality for such an amazing product. I've started mixing the black and brown shade now that I've lightened up my hair and it's the perfect shade to match! Anybody else gone through 30 pans of this? I've finally hit pan on this one and I'm so surprised that I actually havent smashed the powder or broken the packaging yet as it always happens me! There's not much to say about this other than I constantly re-purchase it as it does it's job and does it well and all for a price that does not break the bank. This has been my most used palette since getting all three from the range and I swear I just fell in love with the Chocolate Milk shade it's basically my go to colour for my everyday makeup look. This is the shade I put through my crease and then I'll apply a black shade to my outer v and bam all done. I adore the quality of these shadows and I honestly cannot remember the last time I actually hit pan on an eyeshadow so this made me very excited. Have you finished or hit pan on any products recently? Love the NYX HD concealer! I have a back up ready and waiting even though I'm nowhere near finished it haha! 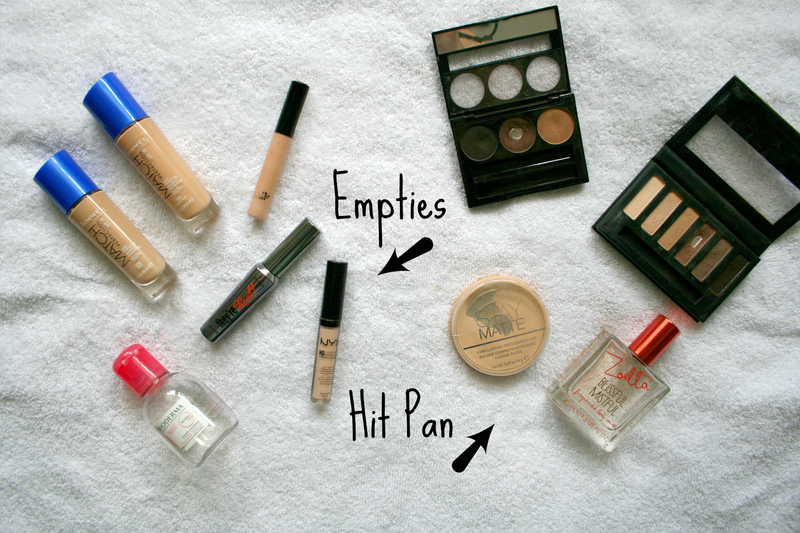 I love reading about empties so freaking much! I realy want to try this nyx concealer and the rimmel powder when i run out of mine! Such a lovely post, i really enjoyed reading this!